The left side of Lincoln’s face was much smaller than the right, an aberration called cranial facial microsomia. The defect joins a long list of ailments — including smallpox, heart illness and depression — that modern doctors have diagnosed in Lincoln. Lincoln’s contemporaries noted his left eye at times drifted upward independently of his right eye, a condition now termed strabismus. Lincoln’s smaller left eye socket may have displaced a muscle controlling vertical movement, said Dr. Ronald Fishman, who led the study published in the August issue of the Archives of Ophthalmology. “Lincoln noticed double vision only occasionally and it did not bother him a great deal,” said Fishman, a retired Washington, D.C., ophthalmologist and history buff. 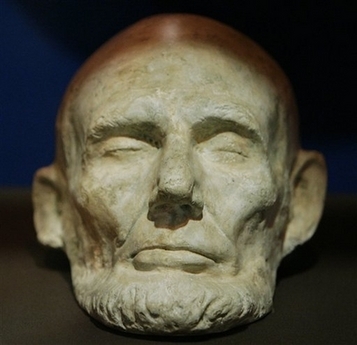 Most people’s faces are asymmetrical, Fishman said, but Lincoln’s case was extreme, with the bony ridge over his left eye rounder and thinner than the right side, and set backward. Lincoln’s appearance was mocked by his political enemies, historians say. The author Nathaniel Hawthorne, a Lincoln fan, wrote of the president’s “homely sagacity” and his “sallow, queer, sagacious visage.” Hawthorne’s description was deemed disrespectful and deleted by a magazine editor, said Daniel Weinberg, owner of the Abraham Lincoln Book Shop in Chicago. Mount Rushmore sculptor Gutzon Borglum described the left side of Lincoln’s face as primitive, immature and unfinished. When Lincoln was a boy, he was kicked in the head by a horse. Laser scans can’t settle whether the kick or a developmental defect — or neither — contributed to Lincoln’s lopsided face, Fishman said. “It’s the equivalent of TV face time now,” Cornelius said. This entry was posted on Thursday, August 16th, 2007 at 12:38 am	and is filed under Lincoln. You can follow any responses to this entry through the RSS 2.0 feed. Responses are currently closed, but you can trackback from your own site. Hello, for some reason when i place your feed into google reader, it won?t get the job done. Can you give me the Rss link simply to be positive I?m using the most suitable one?